Control of biological pests, including mosquitoes, houseflies, gnats, and tree-consuming predators like the eastern tent caterpillar, is frequently achieved through the use of microbial membrane proteins. For example, several varieties of Bacillus thu-rigiensis produce proteins that bind to cell membranes in the digestive systems of insects that consume them, creating transmembrane ion channels. Leakage of Na+, K+, and H+ ions through these membranes in the insect gut destroys crucial ion gradients and interferes with digestion of food. Insects that ingest these toxins eventually die of starvation. 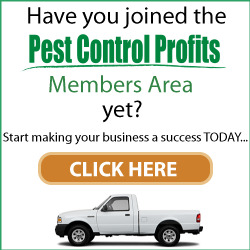 B. thurigiensis toxins account for more than 90% of sales ofbiological pest control agents. B. thurigiensis is a common Gram-positive, spore-forming soil bacterium that produces inclusion bodies, microcrystalline clusters of many different proteins. These crystalline proteins, called S-endotoxins, are the ion channel toxins that are sold commercially for pest control. Most such endotoxins are protoxins, which are inactive until cleaved to smaller, active proteins by proteases in the gut of a susceptible insect. One such crystalline protoxin, lethal to mosquitoes, is a 27 kD protein, which is cleaved to form the active 25 kD toxin in the mosquito. This toxin has no effect on membranes at neutral pH, but at pH 9.5 (the pH of the mosquito gut) the toxin forms cation channels in the gut membranes. This 25 kD protein is not toxic to tent caterpillars, but a larger, 130 kD protein in the B. thurigiensis inclusion bodies is cleaved by a caterpillar gut protease to produce a 55 kD toxin that is active in the caterpillar. Remarkably, the strain of B. thu-rigiensis known as azawai produces a protoxin with dual specificity: in the caterpillar gut, this 130 kD protein is cleaved to form a 55 kD toxin active in the caterpillar. However, when the same 130 kD protoxin is consumed by mosquitoes or houseflies, it is cleaved to form a 53 kD protein (15 amino acid residues shorter than the caterpillar toxin) that is toxic to these latter organisms. Understanding the molecular basis of the toxicity and specificity of these proteins and the means by which they interact with membranes to form lethal ion channels is a fascinating biochemical challenge with far-reaching commercial implications. membrane proteins and remain membrane-associated even when the lipid is removed. Covalently bound lipid in these latter proteins can play a role distinct from membrane anchoring. 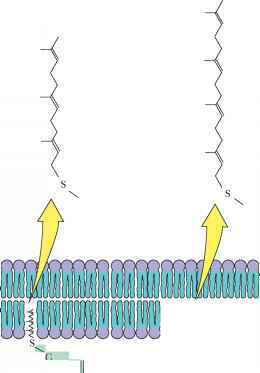 In many cases, attachment to the membrane via the lipid anchor serves to modulate the activity of the protein. Another interesting facet of lipid anchors is that they are transient. Lipid anchors can be reversibly attached to and detached from proteins. This provides a "switching device" for altering the affinity of a protein for the membrane. Reversible lipid anchoring is one factor in the control of signal transduction pathways in eukaryotic cells (Chapter 34). Four different types of lipid-anchoring motifs have been found to date. These are amide-linked myristoyl anchors, thioester-linked fatty acyl anchors, thioether-linked prenyl anchors, and amide-linked glycosyl phosphatidylinosi-tol anchors. Each of these anchoring motifs is used by a variety of membrane proteins, but each nonetheless exhibits a characteristic pattern of structural requirements. Myristic acid may be linked via an amide bond to the «-amino group of the N-terminal glycine residue of selected proteins (Figure 9.18). The reaction is referred to as A-myristoylation and is catalyzed by myristoyl-CoA:protein N-myris-toyltransferase, known simply as NMT. N-Myristoyl-anchored proteins include the catalytic subunit of cAMP-dependent protein kinase, the pp60src tyrosine kinase, the phosphatase known as calcineurin B, the «-subunit of G proteins (involved in GTP-dependent transmembrane signaling events), and the gag proteins of certain retroviruses, including the HIV-1 virus that causes AIDS. FIGURE 9.18 • Certain proteins are anchored to biological membranes by lipid anchors. Particularly common are the W-myris-toyl- and S-palmitoyl-anchoring motifs shown here. W-Myristoylation always occurs at an N-terminal glycine residue, whereas thioester linkages occur at cysteine residues within the polypeptide chain. G-protein-coupled receptors, with seven transmembrane segments, may contain one (and sometimes two) palmitoyl anchors in thioester linkage to cysteine residues in the C-terminal segment of the protein. A variety of cellular and viral proteins contain fatty acids covalently bound via ester linkages to the side chains of cysteine and sometimes to serine or threonine residues within a polypeptide chain (Figure 9.18). This type of fatty acyl chain linkage has a broader fatty acid specificity than A-myristoylation. Myristate, palmitate, stearate, and oleate can all be esterified in this way, with the C16 and C18 chain lengths being most commonly found. 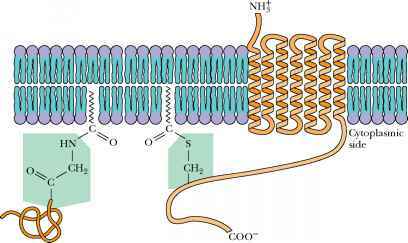 Proteins anchored to membranes via fatty acyl thioesters include G-protein-coupled receptors, the surface glycoproteins of several viruses, and the transferrin receptor protein. As noted in Chapter 7, polyprenyl (or simply prenyl) groups are long-chain polyisoprenoid groups derived from isoprene units. Prenylation of proteins destined for membrane anchoring can involve either farnesyl or geranylgeranyl groups (Figure 9.19). The addition of a prenyl group typically occurs at the cysteine residue of a carboxy-terminal CAAX sequence of the target protein, where C is cysteine, A is any aliphatic residue, and X can be any amino acid. As shown in Figure 9.19, the result is a thioether-linked farnesyl or geranylgeranyl group. Once the prenylation reaction has occurred, a specific protease cleaves the three carboxy-terminal residues, and the carboxyl group of the now terminal Cys is methylated to produce an ester. All of these modifications appear to be important for subsequent activity of the prenyl-anchored protein. Proteins anchored to membranes via prenyl groups include yeast mating factors, the p21ras protein (the protein product of the ras oncogene; see Chapter 34), and the nuclear lamins, structural components of the lamina of the inner nuclear membrane.